The 5th Annual CanAm Challenge Regatta for Soling 1M’s was held in Stowe, VT on September 6th & 7th. We tried a Fri/Sat format to allow skippers to also participate in the Soling 1M Region 1 Team Race in Worcester, MA on Sunday. We had 25 entries this year, maintaining the trend of a few more boats added each year. There were 9 Canadian entries (with the largest contingent from the Halifax, NS club), and we are aware of a conflict with a major RC event out in the Kingston, Ontario area. George Dean and Bob Letwenski, our RD’s, dealt with light & variable winds on Friday, and even lighter winds on Saturday, but managed to keep the pace moving along. We ran two-fleet racing under the Odd/Even system, which works well with the regatta’s theme: “A Friendly Cross-Border Rivalry”. The racing was based on individual performance – no team racing allowed. Yet, in addition to individual scoring, we also took the top 4 scores from each country for the team results for that race. In this manner, any sailor could help out his team by scoring in the top 4 for their team in any given race. Nine races (18 heats) were run on Friday, with 1 throw-out. The variable conditions made things interesting. No one was immune from “getting Stowed” in at least a few races. 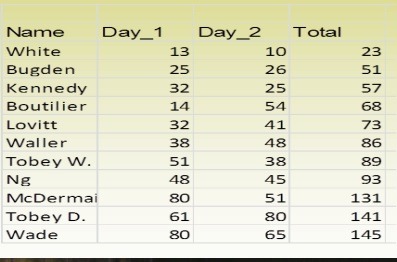 At the end of the first day, Jim Goddard (18 pts) and Boots Boutilier (19 pts), both hailing from Halifax, NS, held slim leads over Bruce Nourjian (20 pts) and Charlie Berry (20 pts), both from Stowe. In team scoring, the USA (87 pts) held a 16 pt. lead over Canada. That evening, the Commodores Inn held a great buffet dinner for the sailors & guests. Lots of talk about “how tomorrow would be different”. The camaraderie both on and off the water said that there will, indeed, be a next year. This “friendly cross-border rivalry” is now an established tradition. It was great to see a new group of 4 skippers from the NH Boat Museum club (Lake Winnipesaukee) join us this year. The 2014 date will be determined and promoted well in advance to avoid as many conflicts as possible and to build support from other U.S. and Canadian clubs. sunny October skies at Dartmouth’s Sullivan’s Pond. Perennial national and international champion Jim Goddard was unable to compete this year, as he was preoccupied with duties related to the coincident Nova Scotia Provincial Election. saw HAMYC Commodore Bob White eke out a one-point lead over Boots Boutilier. 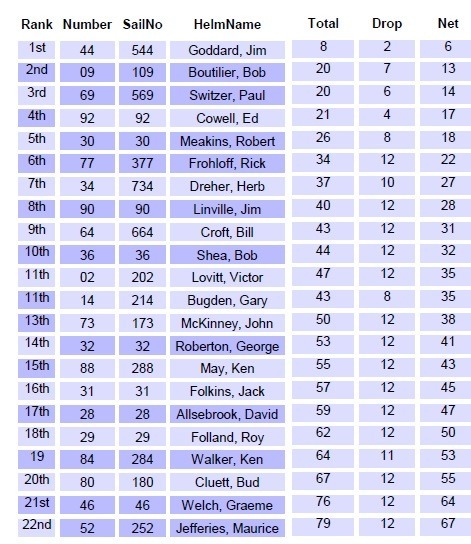 I was in a solid third, followed closely by up-and-comer Mike Kennedy and Victor Lovitt who were tied for fourth. The northwest winds persisted during the second day. Unfortunately, Boots suffered an irreparable breakdown halfway through the afternoon, which took him out of the last five of ten races. Commodore Bob continued to sail consistently while Mike Kennedy and I fought it out for second. 2013, and R/C newcomer Mike Kennedy who had to accept third place because of a couple of bad races the first day. A good time was had by all.